Pop diva extraordinaire Mariah Carey visited the island of Oahu last week to film a video for her song, I’ll Be Lovin’ U Long Time. I was really hoping to run into her at the mall or Matsumoto’s Shave Ice, but, alas, that didn’t happen. Instead, to get my Mariah fix, I listened to some of her songs (Vision of Love was the *jam*, ya’ll) and looked at old and new pictures of her on a few fan sites. One of the things I noticed was how her hair has evolved over the years. I liked her tight, old-school curls, but I’m partial to the big, bouncy curls she wears a lot now. 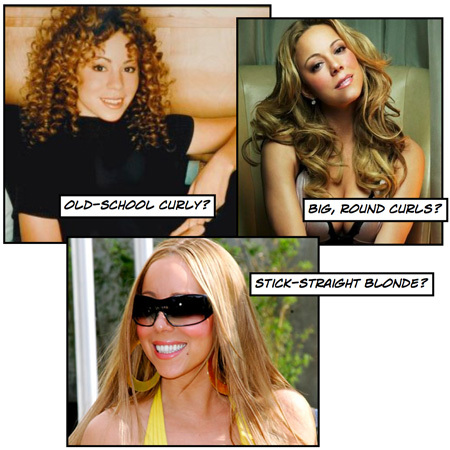 Which Mariah hairstyle is your favorite? In other Mariah news (can’t you tell I’m a fan? ), Women’s Wear Daily reports that she just recently released a new perfume called Luscious Pink, created in conjunction with Elizabeth Arden. A followup to last year’s M by Mariah Carey, Luscious Pink is a floral with notes of Sicilian bergamot, Tahitian tiare petals, lily of the valley, sandalwood and white musk. I haven’t caught a whiff of it, so that’s off the marketing. The collection includes eau de parfum sprays in three sizes â€” 1 oz. for $39.50, 1.7 oz. for $55 and 3.3 oz. for $65 â€” as well as a 6.8-oz. body lotion for $28. I guess it’s so new that it’s not yet listed on the Elizabeth Arden site. When I get back home this week, I’m going to try to get my hands on a bottle and will let you know what I think. If you get your hands on it between now and then, let me know if it moves you. I’m not a huge fan of Mariah but I definatly prefer her big round curls. The tight ones are just sooo gross and her face is too fat for straight hair. Been reading your blog for a while. Its FAB!! I had to reply to this, as I love Mariah too!! Must admit, love the big round curls she wears now a lot, but loved her hair darker…..not a fan of the blonde straight hair!! I so want her big round curls! I tried and tried and tried but all I got was weird hairstyle >_< Her hairstyle during that Mimi time was the best, now it’s not all that. I picked the big round curls…but old school curly is a close second. Too bad you didn’t get to chill with Mariah. Honestly I am a fan…she has a phenomenal voice…regardless of any craziness in her personal life. I’m still kinda stunned that she and Nick Cannon got married. Thanks, girl! I’ve been a huge Mariah fan for, um, forever. 🙂 What’s your favorite song? Ooooh favourite song is a tough one, as love all her stuff!! Probably Say Somethin’, Honey or one of the older songs. Love them all!! Have loads of favourites. What are your favourites? Yeah, I too cannot get over that she has married Nick, what was she thinking?!! I like Mariah even while her Glitter era.